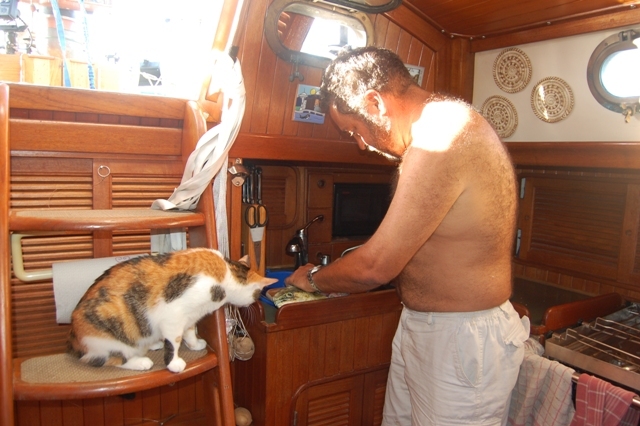 The first part of this passage was a little disappointing from a fishing perspective, especially for boat cat Maya. We trolled and caught nothing. As we left atolls and sea mounts behind the odds of finding fish in the middle of no where dwindled. Maya has been directing fishing operations lately, partly to alleviate boredom and partly to ensure we are doing everything we can to catch fish. We lost the first Mahi Mahi we hooked on one of our green and yellow ‘octopus’ squids while bringing it aboard. Maya was most disgusted. Later that same afternoon we had another bungee explosion as something way too big snatched another of our green and yellow octopi, breaking the 100 pound test SS leader. I was sad to lose a stainless hook and some plastic beads, both rare in the stores of the South Pacific – I have plenty more squids (Yamamshita OCTOPUS size#55 in green/yellow seem to be working very well for us.) Fortunately, the next day we landed two Mahi Mahi, followed by one more yesterday. This has given us another successful lure, a blue and white skirt attached to a faux-pearl head with rhinestone eyes I found in a store in the Marquesas. Maya is ecstatic, glad we finally managed to overcome our clumsiness and pull some fish onboard. I’m her best buddy when I’m cleaning a fish, she will eat sashimi until she gets sick. Perhaps hubris at our current fishing success, we have deployed the 8″ cedar plug, which was deadly against the larger Mahi Mahi in Central America. It would be nice to land enough meat to fill the freezer before stopping tomorrow. Not sure if she is sensing the end of the passage or if all the fresh Mahi Mahi has picked up her spirits, but Maya seems a bit less bored than just a few days ago. For an outdoor night cat passages are an endurance for her. She still doesn’t like all the noises the boat makes as it plods along in it many different configurations. A pile of pillows topped with a blanket gives her a quiet place to ‘hide’, some days she never comes out. All will be back to normal in another day as we close in on Majuro. All three of us will be happy to have our slowest passage behind us.